‘Substantial Amp is an amplifier simulator for the guitar. The point here is screaming riffs. This is done by filters that feedback into themself for resonance, a harmonic eq which is pretty powerful, and a cabinet circuit consisting of 3 delays that feedback into themself, in series, as in one feeds the next. There’s 4 distortion presets and one clean. Top left side, volume in, if you’re using distortion turn it down some. I know it’s hard to read because of the color scheme. Cutoff/res relates to high pass filters, there’s 2 of these on there. And a feedback knob next to that. I’ve set the limits on these controls so there’s hardly any chance of overload. The 1st filter then goes into a single short-timed delay cabinet. (cab size and feedback controls). Then into distortion, there’s an on/off switch. Then into bitcrush, on/off switch again. Then into filter2, then into the Harmonic eq(bottom left). There’s a “fundamental” knob that relates to the eq. It’s a cool eq. Then it goes into the 3-delay cabinet thing, right side. 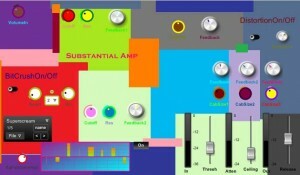 They go in series, this creates resonance which is what this plugin is about. I mean being in series like that, creates a lot of resonance.